Project updates by Idaho Contractor. 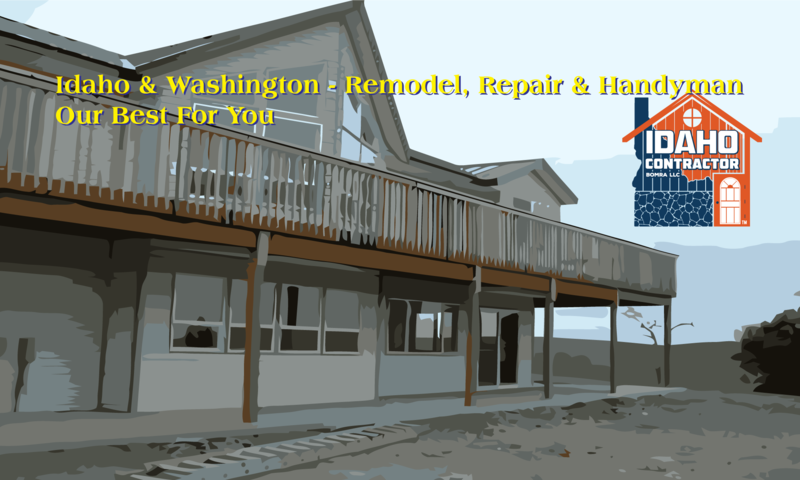 New homes, remodeling, tenant improvements; furniture creation, repair and remodel. We prebuilt this storage system and here it is in transit. Our client wanted a large cupboard to get some items out of view and five big shelves to go along with this. 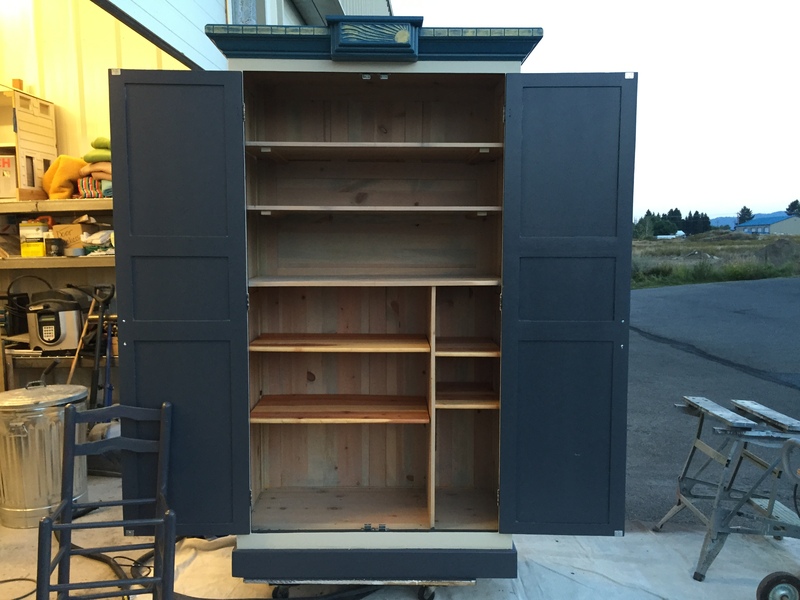 The cupboard is approx 4 feet wide and 8 feet tall and about 18 inches deep, with adjustable shelves inside. The shelves, to the left, are 16 inches deep and 8 feet long. There is plenty of storage here to clean up and organize the most obstinate of garages. The construction of the unit is AC plywood. Our client wanted to do their own painting, which is fine, but we can paint or stain to any color of your choice. Although this unit was built from hemlock and douglas fir plywood, it looks as clean and professional as if it were oak. The doors are one-half inch overlay, held to the cabinet by concealed, modern European hinges. The pictures below show the cabinet with doors open and with doors closed. You can see there is a lot of storage in this combination of cupboard and shelves. Tools and boxes went on the open shelves, while backup food storage and personal papers went into the cupboard. The customer was pleased as we exceeded her expectations – and this did not cost a lot of money. Call us today if we can help you with your storage needs. Spring is in the air and you want your backyard to be inviting and relaxing in the coming summer months. There is nothing better than a patio and pergola. 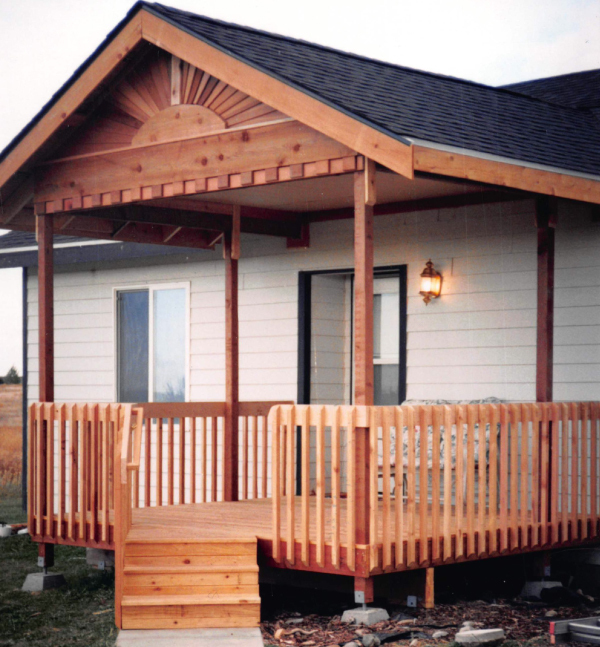 Our pergolas are constructed out of pressure treated lumber or cedar. They are well brace with ornate corbels, held fast with 1/2 inch bolts and bridge washers. The photos to the right were taken during the construction. View the movie below to see the completed project. In this back yard, we installed over 120 feet of sidewalk, three pergolas and a site built shed to match the house. A shed is the perfect way to hide and safely store your tools, including lawn mowers, leaf blowers, gardening tools, handyman tools and snow blowers. This shed was built to match the house in every detail, including the siding, trim, roofing, closed soffits, and gable shingles. A foundation was poured and the shed built on top. It turned out very nice and the homeowners are very happy. In fact, if the shed was empty of tools, this would be a good place for the grandkids to stay and have a sleep out. Be sure to take a minute and watch the short movie below and see the completed project. Let us know if you want us to build a pergola or shed for you. We guarantee you will be pleased with the results and want to move into your backyard. Are you looking for something dramatic that will set your home apart? 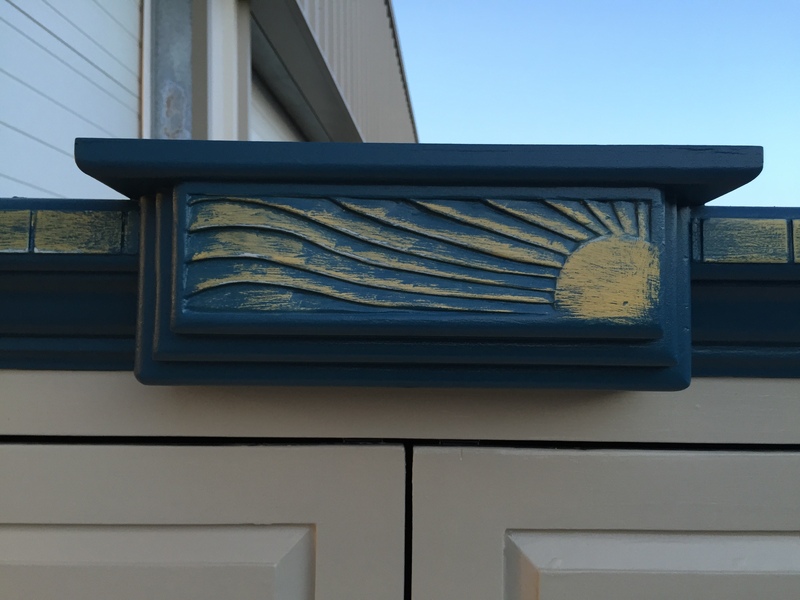 Let people know you are creative and you love your home by creating and installing a dramatic sunburst flair in the gable – or two. Here are a few examples of some we have done over the years. The first one, on the right, was created in Monroe, Washington. At the time, the house was in an obscure development of acreage tracts, north of town in the country. Fewer than a half-dozen homes were built and this house was near the end, the second to last cul-de-sac; so traffic was nill, if at all. By the end of the first day’s work on this gable, there were several cars going in and out of the cul-de-sac to look at the gable. By the end of the second day, there was non-stop traffic; which continued for a few days. The sun, in this gable, is bandsaw art of the sun rising over the mountains. Very appropriate for this venue. Above the band are reverse corbels and a water sill. Under the band is cut, dentil molding. All these products were created in our shop. All the cedar bursts point to the center of the sun. This sun burst was installed for our plumber’s brother. We built the entire home, as is the case with every one of these gable pics on this page. But we can also install a burst on a home built by others. My banker, at that time, grew up on this street and her grandfather’s house, which was nothing more than a cabin, was on this lot. We tore the cabin down and built this house. 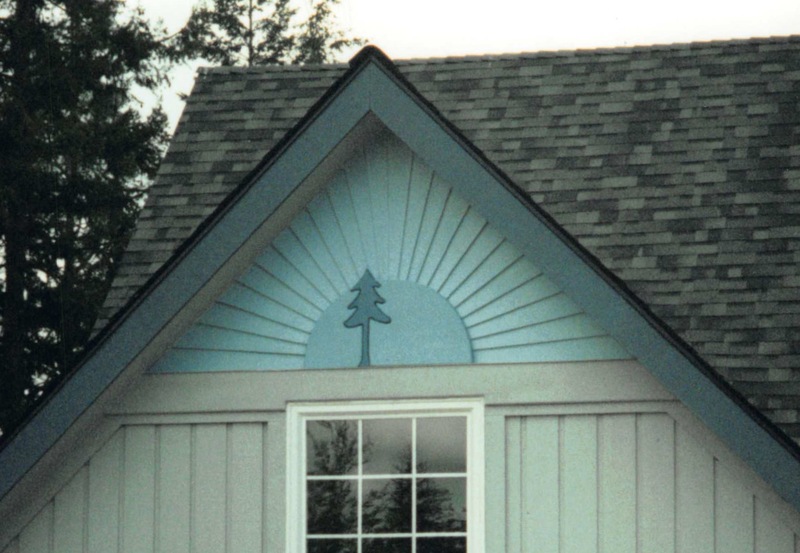 The gable is a simple burst and, along with the cedar face on this wall, accents the house nicely. This burst is on a duplex. The far duplex has a giant sunflower in bandsaw art for the sun. The front duplex has a band which takes an incline upward to the right. After the inclining band, the rest of the gable is finished in rounded and diamond shaped shingles. These are individually applied, not sheets. The sun sits at the crotch of the band and all the rays or beams point to the crotch of the angle. This work so impressed the president of the graphic artists union, he bought the place. Here are two gables shown together. 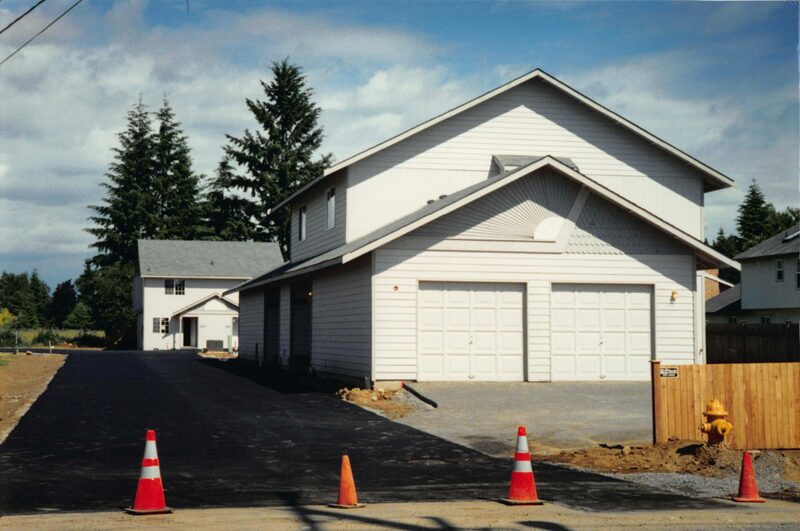 The top one was built south of Bothell, Wa, just off Simonds Road. This house is fully engineered and where the corner of the upstairs comes together, you would normally expect to see a post in the garage holding it up (and the beam) – but there is no beam or post. The wonders of mathematics. The bottom gable is off a house in Moses Lake. This house has a lower roof pitch than the one above but the two gables are shown together because they are similar. The sun is bandsaw art with a double or triple keystone at the top. Below the sun is a water sill above the band. Then there are block dentils, set on another band to bring them out past the cut dentil molding below them. This is a sunburst built in to the gable of a new deck. The sun is not quite a half round with squared off ends. 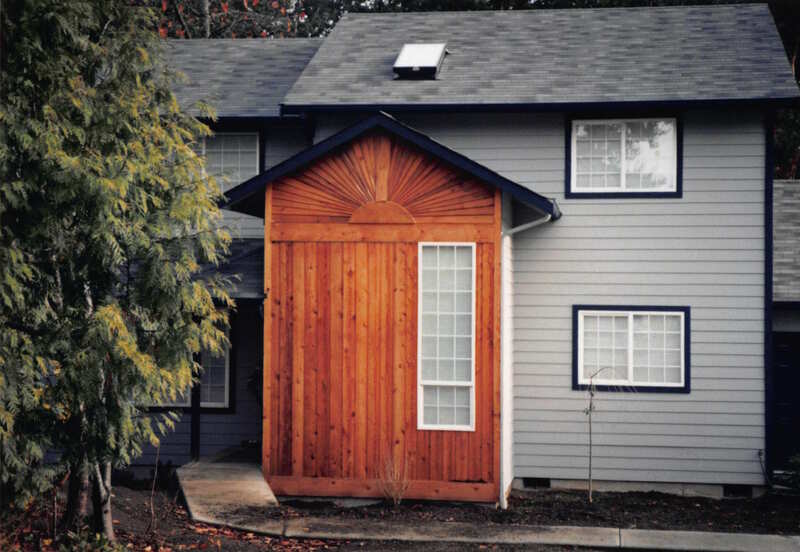 Cedar siding is used for the burst. Below the sunburst is a water sill, then a band and below the band are block dentils. 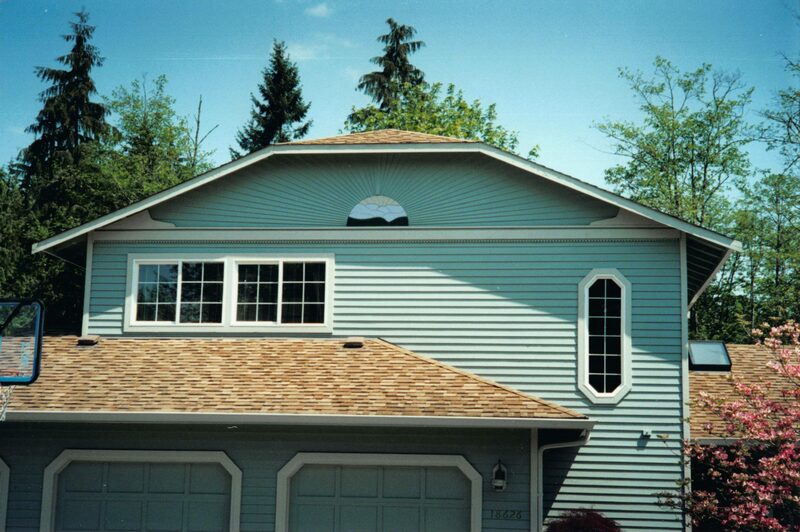 This gable not only makes the deck unique but it gives the home a very distinguishing look. You can click on these pictures to see a larger image. This is one of my favorites. Favorite for its simplicity. This home was built above Dalton Gardens, in Idaho. The sun is bandsaw art of an evergreen tree set into the sun. Below the sun and the burst is a band, which is set in 3D to the siding trim. The cedar siding used for the rays all point to the middle of the complete circle of the sun. 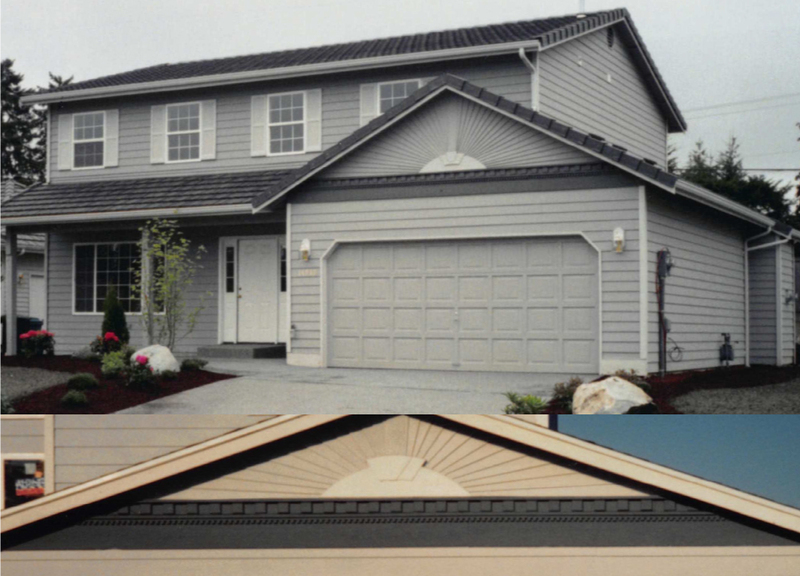 Gable art is fun to do and it gives your home a very distinctive look. It tells people you enjoy creativity. I hope you have enjoyed these. Let me know if we can do one for you. You may send us an email via the contact page. We can even carve sunbursts into furniture! 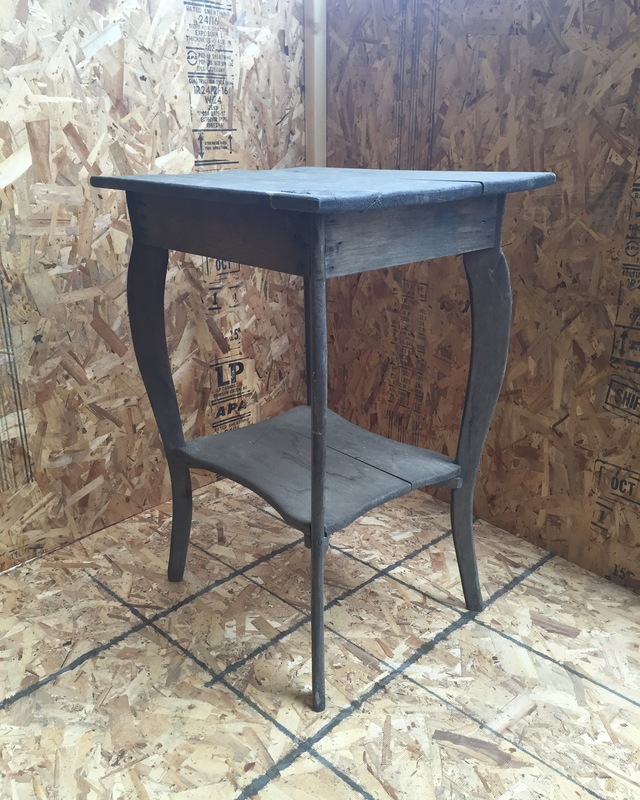 First sample is a small end table. 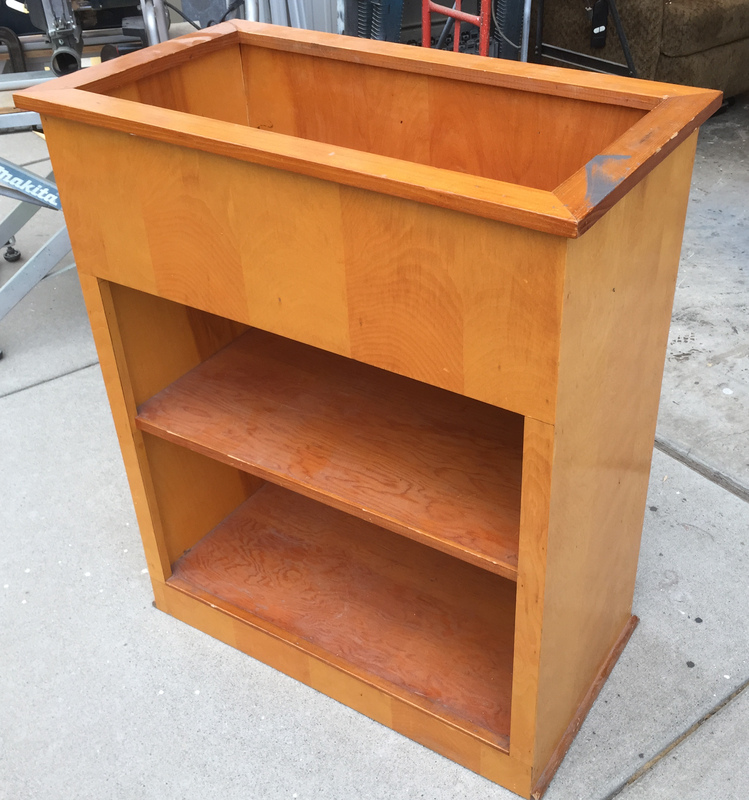 I am sorry, we did not take a before picture of this piece of furniture. The table and drawer were stained a light red cherry. They were made from cherry wood and the look was good. However, the drawer broke and we made a replacement drawer from pine – what we had on hand; and we didn’t want to put a lot of money into it. So, the decision to paint was made for us. 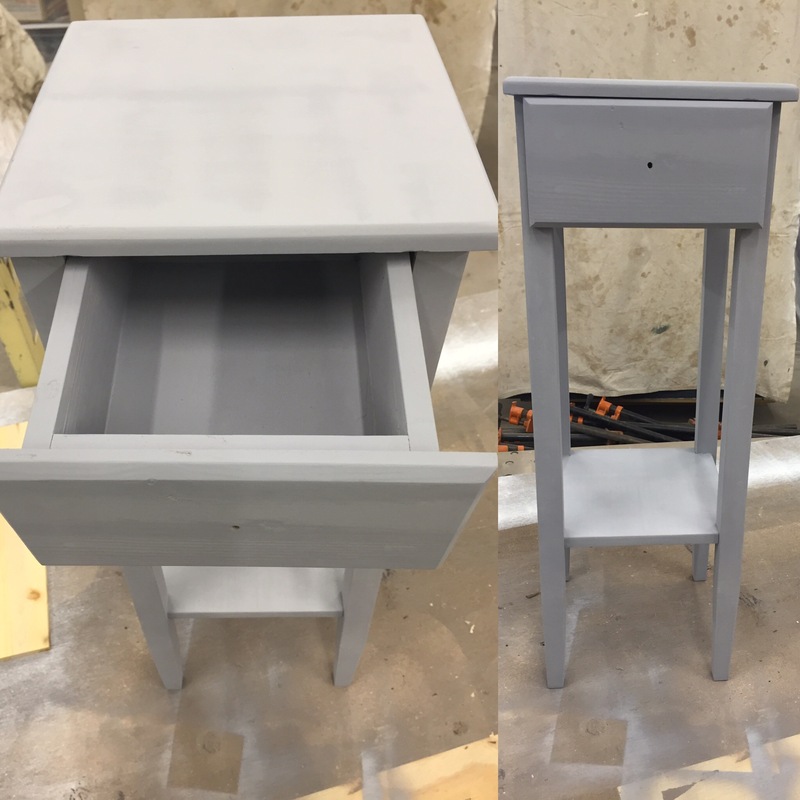 To the far right is a photo of the end table and drawer with primer. The closer photo is with the paint and distressing completed. We finished the project with three coats clear acrylic top coat. It looks good, functions well and is ready for a new home. Here is another project with no before picture (sorry). The dining table and the chairs came from two different sets. 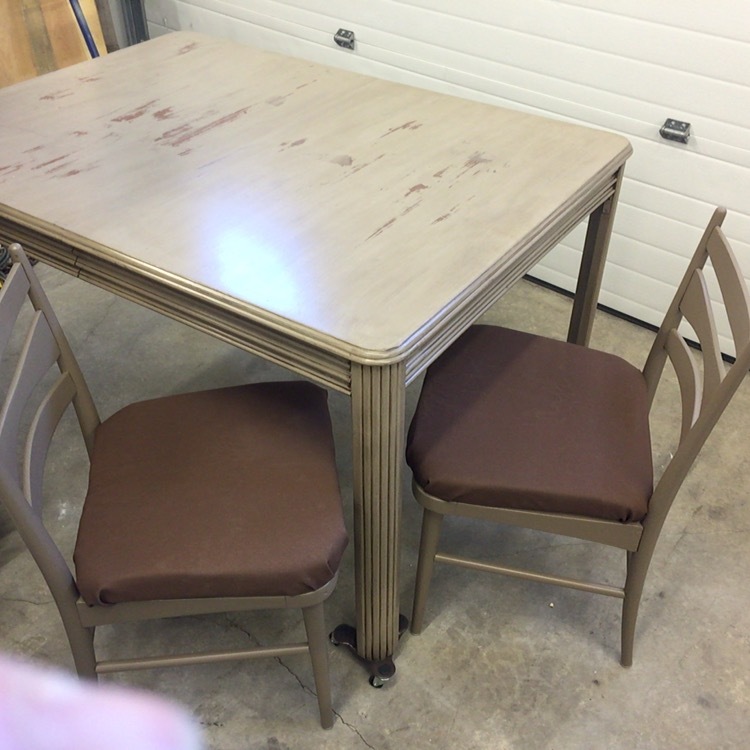 The dining table is a mahogany and the chairs are a light hardwood. The table had six legs with ugly fretwork/bracing between. We removed two of the legs, the bracing and the table extensions. We sealed the top of the table – because it is going to extend no more; and we didn’t want food getting stuck in the cracks. 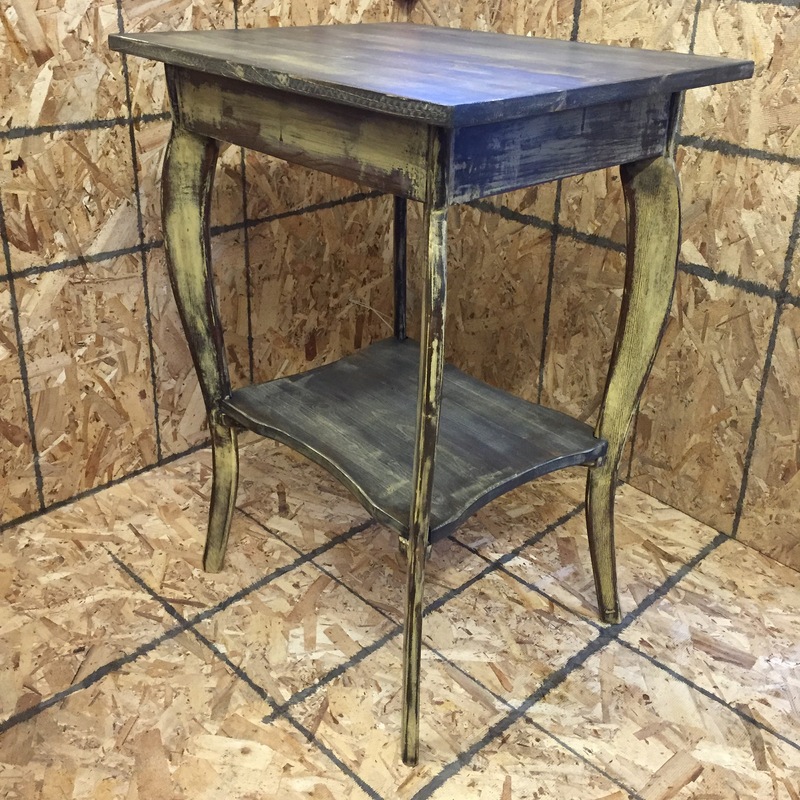 It is painted a tan with a hint of green and glazed and distressed with dark stain. The photo shows two chairs but there are six in the set. The chairs were painted a light coffee color and re-upholstered. When we took the chairs apart, several of the seat bases had been eaten up by bug colonies. Fun! Everything received three coats clear acrylic finish. Here was a very fun project: This was from the sixties – maybe the fifties! This unit housed two bookshelves with a planter on top. Some of you will remember those. The far right picture is the before photo. The near right photo is the early phase of the remodel and shows the drawer opening cut into the face of the planter section and heavy feet installed under the base. The drawer and the doors were built from AC fir plywood and the drawer has a full extension slide (100 lbs rating). You can put a lot in this drawer and this cabinet will make a good accessory unit in the kitchen. To finish the project we found some industrial looking smooth door handles and a vintage style drawer pull. We installed a new top, covering the planter opening and trimmed the sides with a thin cove moulding. 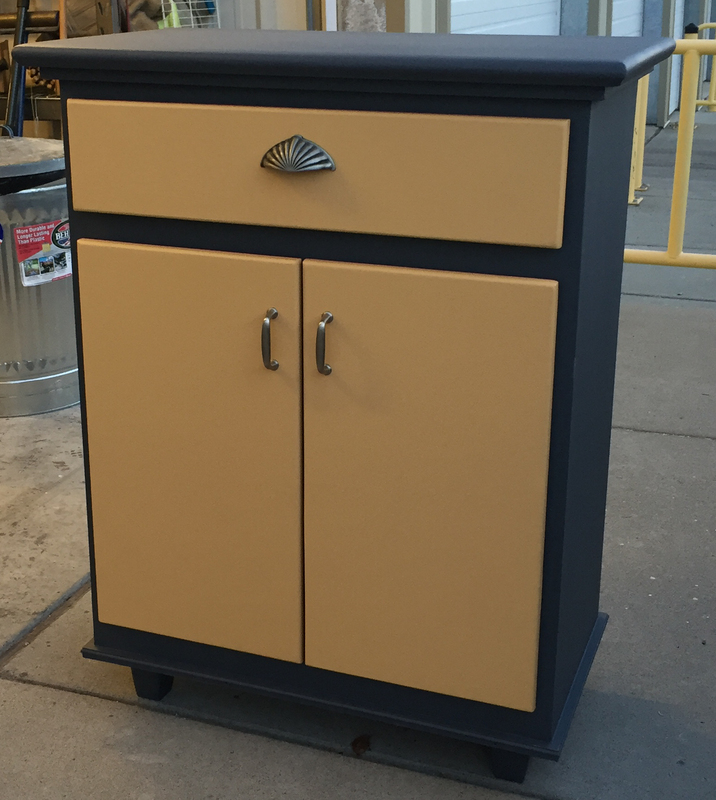 We painted the body of the furniture a dark grey and the doors and drawer face a mustard color. The top finish is three coats of clear acrylic. This was fun and the cabinet is sure to be very handy. Who does this? Who takes furniture damaged in a fire and refinishes it? We do! The far right photo is how it looked after salvage. The near right photo is how it looks after restoration. The top and the lower shelf were toast – so to speak. We replaced these with pine. 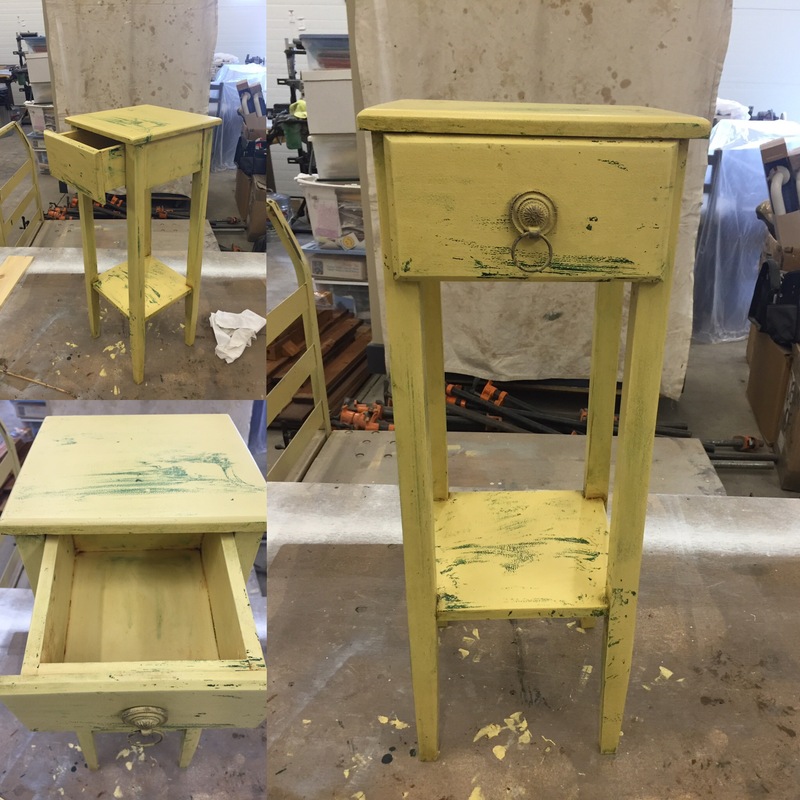 Then we finished/re-finished the furniture to make it look very distressed with a hint to a previous yellow color. The result was wonderful. People love this one and when I show them the before picture, they are quite surprised. New home coming soon. This is an armoire I built thirty years ago. It was eight feet, six inches tall. 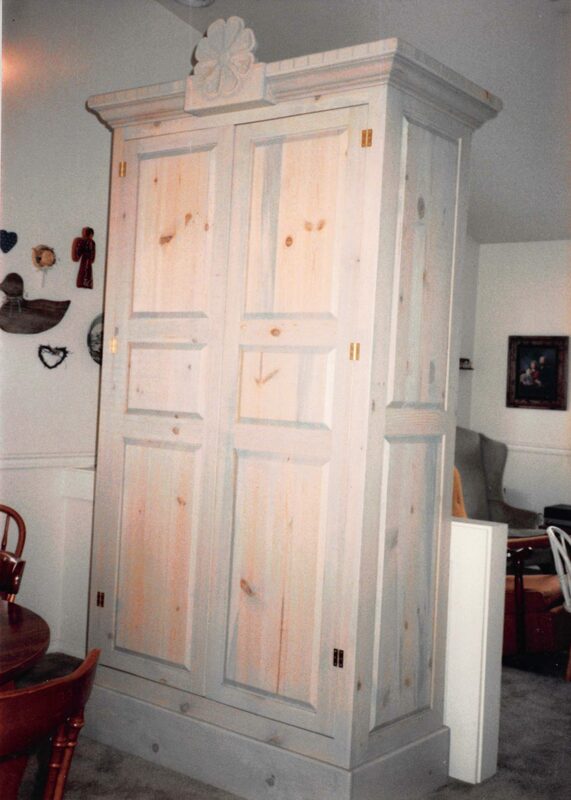 It had a sunflower for the front carving and the whole cabinet was stained light blue – a wash – inside and out. We decided to lower it by cutting half the base and lowering the front carving. Now, it will fit under a standard seven foot, eleven inch ceiling; including the arc needed to tilt it into place. The far right photo is the original look and the near right photo is the new style after the renovation. We left most the interior in the original wash and added a few clear finished pine shelves for more utility. The inside of the doors, are now a dark grey color. The body color is beige, almost a yellow. The crown and dentil mouldings on top are a deep blue color with a distressing of gold. The base is dark grey – like the inside of the doors. There are carvings on every side of this cabinet and the raised panel construction is all the way around as well. This armoire could sit in the middle of the room; there is no side you would want to hide against a wall. When I originally built this, its purpose was a room divider between the living and dining rooms, which had a short half-wall. 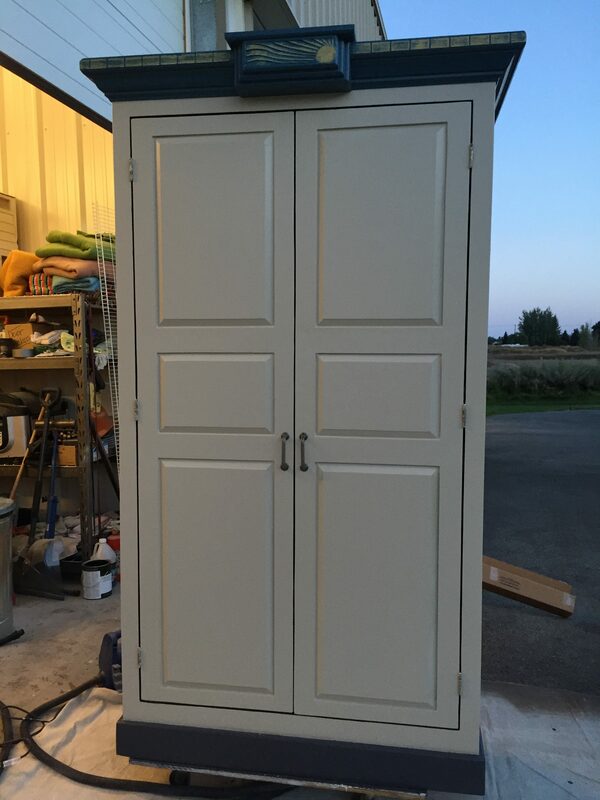 Look inside this cabinet – the storage is huge – it will hold half our worldly possessions! We have had this armoire in our home for thirty years or more. Lord willing, we will keep it another thirty years. 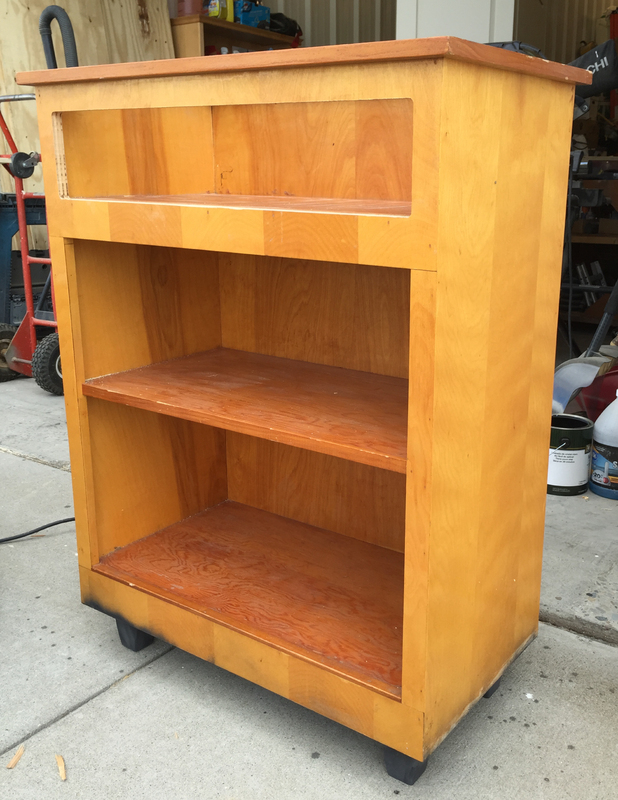 Let me know if we can refinish some furniture for you – or create something new. In our last article, regarding the tenant improvements for Mittmann Architect in Coeur d’Alene, Idaho, we mentioned building two shelf units using black iron pipe. They turned out beautiful and our client is very pleased. So, we thought we would build a unit for someone else – maybe for you! This pipe shelf unit is made from pine and black iron pipe. The width is three feet wide and twelve inches deep. The spacing between the shelves is just over fourteen inches at the bottom and the next two are just over twelve inches. The coloring is grey and yellow – distressed. After color coats, we applied three coats of acrylic clear coat. This shelf unit is just an idea of what we can do for you. The possibilities are limitless: we can build you a table, desk, shelf unit or we can cover your entire wall! Call us if you want to talk about pipe shelves and pipe furniture by idaho contractor. When Shelli Mittmann decided to open her office in mid-town Couer d’Alene (CDA), she wanted to make a statement when filling her empty space. The walls were a neutral color but a little darker than what she wanted. Due to budgetary constraints, she opted to paint the walls herself, using a lighter color. Previously, the walls and trim were the same color but she left the trim unpainted and it proved to be a good accent color for the wall paint she selected. The room had a dark low-nap carpet and exposed HVAC ducts. The exposed heat ducts were an excellent complement to the industrial look she wanted. We added a conference alcove with rough pine siding installed on all sides. There is a relight in the front, so that someone sitting in the conference area can see when people walk in the front door. These two photos are of the framing and the work in progress installing the rough pine siding on the walls. Before the siding was installed on the wall, we conditioned the face with Daly’s Benite and stained all sides with Minwax stain. The Benite brings out the grain of the wood and reduces blotching. Staining the wood on all sides helps prevent the boards from cupping and warping. These photos are of the outside and inside of the conference alcove. All the lines continue all the way around all walls and ends of walls, for that clean, industrial look – no trim boards to interrupt the horizontal lines or make the job look cheap. You can click on any of the images in this article to get a closer view of the details. We did some extensive masking before spraying the acrylic finish on the walls. Due to static electricity created by the HVAC system, there was sawdust sticking to the walls. We swept most of it off and, although there is little overspray in acrylic applications, we wanted to prevent any acrylic “dust” floating and bonding any of the sawdust to the walls. We also set up all the shelving units and individual shelf parts ready for spray. And, we went to work. On the right is a photo of the completed conference alcove walls, short wall separating the seating area and wood shelf units. The short wall is attached to the ceiling with two one-inch black iron pipes and fittings. On the left is a photo of the pipe shelf units. We built three of the free-standing pine shelf units and two of the free-standing pipe shelf units. Our client, Mittmann Architect of CDA, Idaho, is very pleased with the tenant improvements and has an impressive office. If you are looking for a home design or other architectural services, be sure to contact Shelli Mittmann. Here is a link to her website – and tell her Idaho Contractor sent you. A good display will make all the difference in the world. Successful marketing begins with unique, attention-getting displays. It is important for a small merchandiser to have a unique theme or look to convert walk-bys into shoppers. CDAidaho.com, known also as CDA Idaho Clothing Company, needed a custom display for clothing merchandising at Coeur d’Alene and other local pop-up events. They wanted their displays to be unique and creative – and they had a few ideas to start with. We built these first displays from old barn wood and they do look great. The rack is built from black iron pipe and the bottom shelf of the table is metal screening. They tell me they get a lot of comments about the furniture and they are a really big hit. Here are a few more displays we have built for them: This first one is a converted locker and reclaimed wood table. The locker had a floor which was rusted through. We removed the rotten floor, ground out all the remaining rust and built a new wood floor. The table gives the lockers stability while in freestanding mode. The locker generates a lot of interest. People like these old things. Inside the open shelves, CDA Idaho Clothing Company displays shirts and hats. The doors were removed to display merchandise effectively. The last door of the upper lockers was not removed as it can display stickers and sometimes it will host sign-up sheets. The table has a lower shelf used to hold overflow stock or hold displays of interest to draw attention. 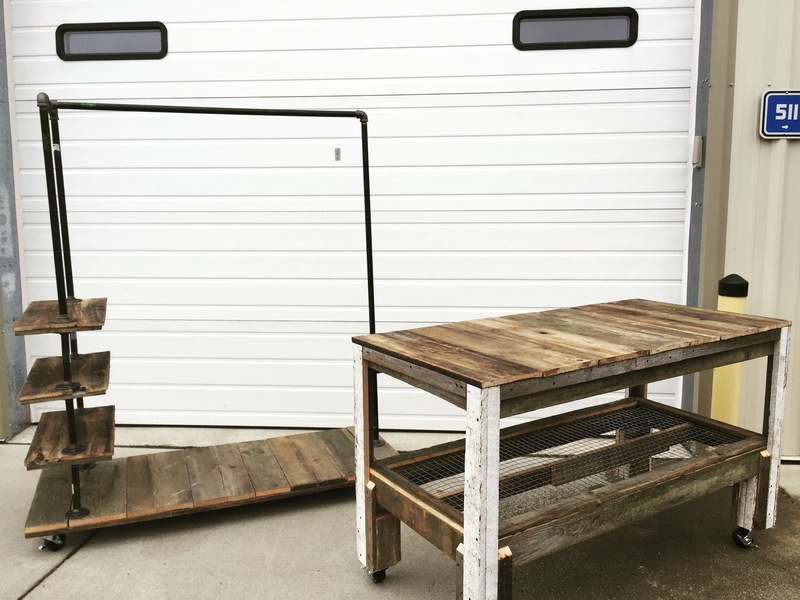 As with all our reclaimed wood products, we apply three coats of clear acrylic to seal the old paints in. Here are a few more displays for CDA Idaho Clothing Company. VinylFire.com needed a new reception area standing desk. We made a two-section unit from rough sawn lumber. They also needed a large workbench with lower shelving to hold sheet goods. This table is five feet wide and ten feet long. It is a killer. 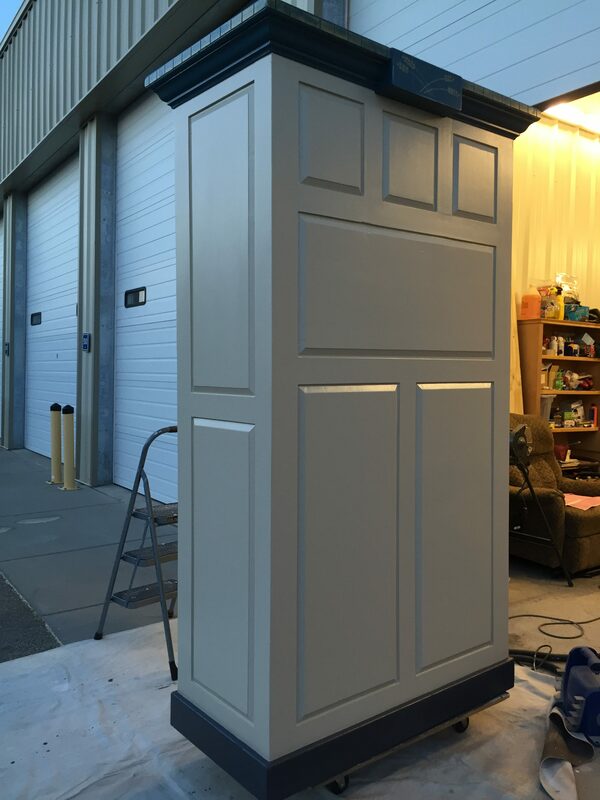 . .
Let Idaho Contractor know if we can help you develop a unique appearance that will draw prospective buyers to your merchandise. Feel free to send us an email via our contact page. Our shop is in Hayden but we service all North Idaho and Eastern Washington for furniture and displays.